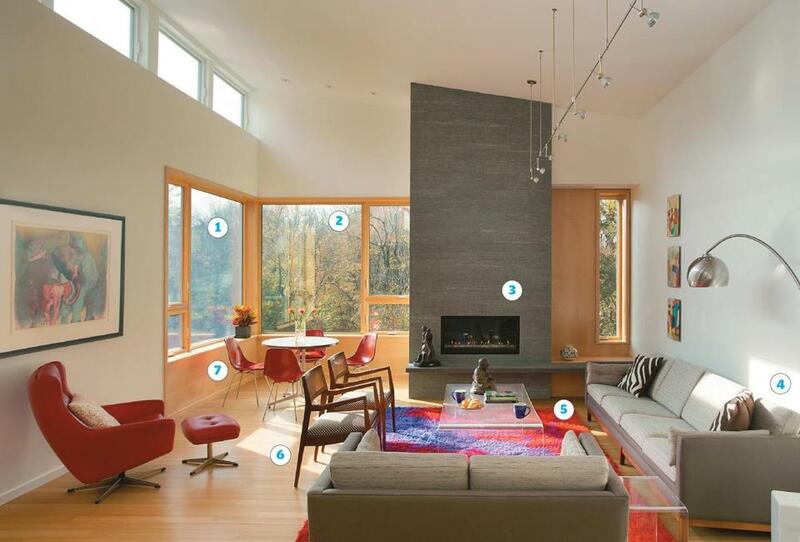 Inherited mid-century treasures work beautifully in this newly built Lexington home. Mid-century meets eco-friendly in the design of this newly built home in Lexington’s modernist enclave, Five Fields. The goals, explains designer Britta McCarthy, who worked with architects Hank Reisen of Reisen Design Associates and Heinrich Hermann of Hermann Design, were to create as close to a net-zero-energy house as possible and to honor the mid-century flavor of the neighborhood. Homeowners Gordon and Sion Harris, who have two teenagers, also wanted a calm, family-oriented space. 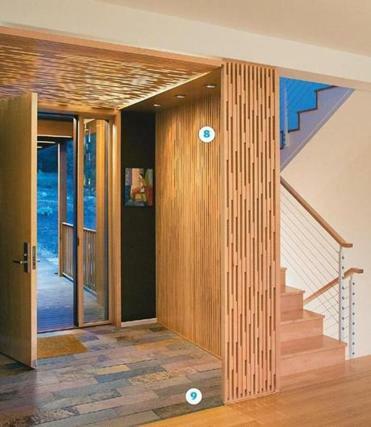 The entry sets the tone, with its enveloping slatted-wood screen. The high-ceiling living room, with its Scandinavian modern treasures passed down from Gordon’s parents, feels welcoming rather than cavernous. 1 | Triple-glazed fiberglass windows allow for large expanses of light and views and optimal energy efficiency. “There’s no hint of draft anywhere,” says McCarthy. 2 | The paneling and interior window frames are finished in maple, which blends almost seamlessly with the bamboo flooring. 3 | Narrow, dry-set stone tiles with a velvet finish clad the chimney. The gas-insert fireplace is a more eco-friendly option than a wood-burning one. 5 | The rug, also from Gordon’s parents, is a traditional Scandinavian wool rya. 6 | The Jens Risom armchairs are mid-century originals, plucked years ago from Gordon’s father’s home office. 7 | The couple inherited the molded fiberglass Herman Miller chairs, which Gordon’s parents painted red to match the rug. 9 | McCarthy handpicked and placed every slate tile. “I wanted the colors and pattern to be just right,” she says.